The House of Representatives Chamber of the Parliament of Australia in Canberra. A parliament is a legislature, especially in those countries whose system of government is based on the Westminster system modeled after that of the United Kingdom. The name is derived from the French parlement, the action of parler (to speak): a parlement is a discussion. The term came to mean a meeting at which such a discussion took place. It acquired its modern meaning as it came to be used for the body of people (in an institutional sense) who would meet to discuss matters of state. The parliamentary system was the first form of representative government to include common subjects (not from the nobility) in the decision-making forum. Legislatures called parliaments operate under a parliamentary system of government in which the executive is constitutionally answerable to the parliament. This can be contrasted with a presidential system, on the model of the United States' congressional system, which operate under a stricter separation of powers whereby the executive does not form part of, nor is appointed by, the parliamentary or legislative body. Typically, congresses do not select or dismiss heads of governments, and governments cannot request an early dissolution as may be the case for parliaments. Some states have a semi-presidential system which combines a powerful president with an executive responsible to parliament. Although numerous forms of representative government existed throughout the ancient world, with few exceptions, most were autocratic and limited the representation to members of the nobility with no direct representation by the common people. Over time, subjects demanded a greater role in the decision making process of their societies. Rulers incrementally acquiesced to these demands, and various forms of commoner representation took hold and their influence gradually expanded. In the modern era, particularly in the democratic system, the authority to rule rests more in the legislative body than with a ruler. The modern parliamentary system originated in England in the late thirteenth century, and was formalized by King Edward I of England at a meeting in 1295, where representatives of rural landowners and townsmen were invited to participate in the Kings Council (Curia Regis) as members of the Commons. ██ Nations with bicameral legislatures.██ Nations with unicameral legislatures.██ No legislature. Parliaments may consist of chambers or houses, and are usually either bicameral or unicameral–although more complex models exist, or have existed (see Tricameralism). The lower house is almost always the originator of legislation, and the upper house is usually the body that offers the "second look" and decides whether to veto or approve the bills. A parliament's lower house is usually composed of at least 200 members in countries with populations of over 3 million. The number of seats may exceed 400 in very large countries, especially in the case of unitary states. The upper house customarily has 20, 50, or 100 seats, almost always significantly fewer than the lower house (the British House of Lords is an exception). A nation's prime minister ("PM") is almost always the leader of the majority party in the lower house of parliament, but only holds his or her office as long as the "confidence of the house" is maintained. If members of the lower house lose faith in the leader for whatever reason, they can often call a vote of no confidence and force the PM to resign. This can be particularly dangerous to a government when the distribution of seats is relatively even, in which case a new election is often called shortly thereafter. However, in case of general discontent with the head of government, his replacement can be made very smoothly without all the complications that it represents in the case of a Presidentialist system. In ancient India, during the Vedic civilization, there are mentions of two Parliament-like gatherings of the Indo-Aryan kingdoms called the Sabhā and the Samiti. There are differing views on the character and function of the Sabha and Samiti, and their precise role is unclear, but it is widely understood that the Samiti was an assembly of the whole people, and the Sabha was a council of elders. Also, the Sabha performed judicial functions and the Samiti did not, and the Samiti fought in wars, while the Sabha did not. The two largely democratic institutions, which kept a check on the absolutism of the king, were given a sacred position, and have been called the daughters of the deity Prajapati in the Vedas, the holiest of all Hindu scriptures and the earliest Indo-European literature. However, these democratic institutions became weaker as republics became larger and elected chieftainship moved towards hereditary and absolute monarchy. The Samiti was not a sovereign body from a constitutional point of view and eventually passed out of existence. The Sabha and the Samiti bear almost no mention in later Vedic literature. In the modern democratic Parliament of India, the two Houses still bear the ancient name of Sabha. In Islam, the line of rulers who by birthright or election succeeded the Holy Prophet Muhammad is called the caliph (kăl'ĭf'), and the Muslim world is the caliphate (kăl'ĭfāt', -fĭt). In its original context, the caliph was a religious and temporal ruler of a geographic region, but by inference the caliphate includes all Muslims everywhere. Islam stipulates rida al awam, that is, popular consent, as a prerequisite to the establishment of legitimate political authority, and ijtihad jama'i, that is, collective deliberation as a requisite to the proper administration of public affairs. Beyond that, Islam stipulates mas'uliyah jama'iyyah, or, collective responsibility, for maintaining the public good of society. Shura is an Islamic tradition sourced in the Qur'an that loosely translates as "consultation of the people." The Qur'an presents shura as a principle, and not as a system of governance, and it has broad cultural applications. Shura has been an integral part of the Caliphate, where the Majlis al Shura (consultative council, or parliament) advised the caliph. Even the Holy Prophet was instructed by Allah to consult with the people (3:159). Shura is predicated on three basic precepts. First, all persons in any given society are equal in human and civil rights. Second, public issues are best decided by majority view. And third, the three other principles of justice, equality and human dignity, which constitute Islam's moral core, and from which all Islamic conceptions of human and civil rights derive, are best realized, in personal as well as public life, under shura governance. Unlike shura, parliamentarism allows modification of foundational texts. You can amend the constitution but not the Qur'an or the Sunnah. Shura remains non-binding to the Caliph, while parliamentary process and laws are binding and can only be reversed through a democratic process, not by unilateral and oligopolistic processes. Islamic discourse makes clear that it is the leader/ruler who initiates any consultation. Shura represents the process of the leader consulting some people; it is not specified whom he should consult–scholars, relatives, or the entire adult Ummah. In parliamentarism, the representatives are chosen by the people, consult among themselves, and initiate laws. England has long had a tradition of a body of men who would assist and advise the King on important matters. Under the Anglo-Saxon Kings, there was an advisory council, the Witenagemot ("meeting of wise men"). As part of the Norman Conquest of England, the new King, William I, did away with the Witenagemot, replacing it with a Curia Regis ("King's Council"). Membership of the Curia was largely restricted to the tenants in chief, the few nobles who "rented" great estates directly from the King, along with certain senior ecclesiastics. Parliament originated in the late thirteenth century, during the reign of Edward I. Like previous kings, Edward called leading nobles and church leaders to discuss government matters, especially finance. A meeting in 1295 became known as the Model Parliament because it set the pattern for later Parliaments. The significant difference between the Model Parliament and the earlier Curia Regis was the addition of the Commons, that is, elected representatives of rural landowners and of townsmen. In 1307, Edward I agreed not to collect certain taxes without consent of the realm. He also enlarged the court system. William of Normandy brought to England the feudal system of his native Normandy, and sought the advice of the curia regis, before making laws. This body is the germ from which Parliament, the higher courts of law, and the Privy Council and Cabinet have sprung. Of these, the legislature is formally the High Court of Parliament; judges sit in the Supreme Court of Judicature; and only the executive government is no longer conducted in a royal court. The first English Parliament was formed during the reign of King Henry III in the thirteenth century. In 1265, Simon de Montfort, 6th Earl of Leicester, who was in rebellion against Henry III, summoned a parliament of his supporters without any or prior royal authorization. The archbishops, bishops, abbots, earls and barons were summoned, as were two knights from each shire and two burgesses from each borough. Knights had been summoned to previous councils, but the representation of the boroughs was unprecedented. De Montfort's scheme was formally adopted by Edward I in the so-called "Model Parliament" of 1295. At first, each estate debated independently; by the reign of Edward III, however, Parliament had been separated into two Houses and was assuming its modern recognizable form. The French Parliament, as a legislative body, should not confused with the various parlements of the Ancien Régime in France, which were courts of justice and tribunals with certain political functions. Originally, there was only the Parlement of Paris, born out of the Curia Regis in 1307, and located inside the medieval royal palace, now the Paris Hall of Justice. The jurisdiction of the Parlement of Paris covered the entire kingdom. In the thirteenth century, judicial functions were added. In 1443, following the turmoil of the Hundred Years' War, King Charles VII of France granted Languedoc its own parlement by establishing the Parlement of Toulouse, the first parlement outside of Paris, whose jurisdiction extended over the most part of southern France. From 1443 until the French Revolution several other parlements were created in some provinces of France. The parlement consisted of a number of separate chambers: the central pleading chamber, called the Grand-Chambre; the Chambre des Requêtes (to deal with petitions) and the Chambre des Enquêtes (to handle inquests); the Chambre de la Tournelle (to settle criminal cases); and finally the Chambre de l'Édit (to process Huguenot affairs), which was active only in the sixteenth and seventeenth century. All the parlements could issue regulatory decrees for the application of royal edicts or of customary practices; they could also refuse to register laws that they judged contrary to fundamental law or simply as being untimely. Parliamentary power in France was suppressed more so than in England as a result of absolutism, and parliaments were eventually overshadowed by the larger Estates General, up until the French Revolution, when the National Assembly became the lower house of France's bicameral legislature. The Parliament, in the modern meaning of the term, appeared in France during the French Revolution. Its form—unicameral, bicameral, or multicameral—and its functions have taken different forms throughout the different political regimes and according to the various French constitutions. The Parliament of Scotland evolved during the Middle Ages from the King's Council of Bishops and Earls. The unicameral parliament is first found on record, referred to as a colloquium, in 1235 at Kirkliston (a village now in Edinburgh). By the early fourteenth century the attendance of knights and freeholders at assemblies had become important, and from 1326 burgh commissioners attended. Consisting of the Three Estates; of clerics, lay tenants-in-chief and burgh commissioners sitting in a single chamber, the Scottish parliament acquired significant powers over particular issues. Most obviously it was needed for consent for taxation (although taxation was only raised irregularly in Scotland in the medieval period), but it also had a strong influence over justice, foreign policy, war, and all manner of other legislation, whether political, ecclesiastical, social or economic. Parliamentary business was also carried out by "sister" institutions, before c. 1500 by General Council and thereafter by the Convention of Estates. These could carry out much business also dealt with by Parliament—taxation, legislation and policy-making—but lacked the ultimate authority of a full parliament. Chamber of the Sejm showing semicircle seating pattern. The term sejm comes from an old Polish expression denoting a meeting of the populace. The power of early sejms grew between 1146–1295, when the power of individual rulers waned and various councils and wiece grew stronger. From 1374, the king had to receive sejm permission to raise taxes. The General Sejm (Polish Sejm Generalny or Sejm Walny), first convoked by the king John I Olbracht in 1493 near Piotrków, evolved from earlier regional and provincial meetings (sejmiks. It followed most closely the sejmik generally, which arose from the 1454 Nieszawa Statutes, granted to the szlachta (nobles) by King Casimir IV the Jagiellonian. From 1493 forward, indirect elections were repeated every two years. With the development of the unique Polish Golden Liberty the Sejm's powers increased. The Commonwealth's general parliament consisted of three estates: the King of Poland (who also acted as the Grand Duke of Lithuania, Russia/Ruthenia, Prussia, Mazovia, etc. ), the Senate (consisting of Ministers, Palatines, Castellans and Bishops) and the Chamber of Envoys–around 170 nobles (szlachta) acting on behalf of their Lands and sent by Land Parliaments, composed of representatives of selected cities but without any voting powers. Since 1573 at a royal election all peers of the Commonwealth could participate in the Parliament and become the King's electors. Iceland's parliament House, at Austurvöllur in Reykjavík, built in 1880–1881. Home of one of the oldest still-acting parliaments in the world. A thing or ting (Old Norse and Icelandic: þing; other modern Scandinavian: ting) was the governing assembly in Germanic societies, made up of the free men of the community and presided by lawspeakers. Today the term lives on in the official names of national legislatures, political and judicial institutions in the North-Germanic countries. In the Yorkshire and former Danelaw areas of England, which were subject to much Norse invasion and settlement, the wapentake was another name for the same institution. The thing was the assembly of the free men of a country, province or a hundred (hundare/härad/herred). There were consequently, hierarchies of thing, so that the local thing were represented at the thing for a larger area, for a province or land. At the thing, disputes were solved and political decisions were made. The place for the thing was often also the place for public religious rites and for commerce. The thing met at regular intervals, legislated, elected chieftains and kings, and judged according to the law, which was memorized and recited by the "law speaker" (the judge). The name of the parliament of Russian Federation is the Federal Assembly of Russia. The term for its lower house, Duma (which is better known than the Federal Assembly itself, and is often mistaken for the entirety of the parliament) comes from the Russian word думать (dumat), "to think." The Boyar Duma was an advisory council to the grand princes and tsars of Muscovy. The Duma was discontinued by Peter the Great, who transferred its functions to the Governing Senate in 1711. In 1905, in response to widespread unrest, Nicholas II granted several concessions, one of which was that no law would become operative without the approval of a new organization called the Duma, or Parliament. The First Duma was elected on the basis of indirect universal male suffrage. The peasants, the townsmen and the gentry all elected their own representatives. Delegates from all the provinces met in the provincial town and chose the members of the Duma. The first meeting of the Duma took place in May 1906. The Russian Duma was replaced by the Совет (Soviet), or Counsel after the Russian Revolution of 1917. After the collapse of the Soviet Union, the institution of the Duma was restored. Although there are documented councils held in 873, 1020, 1050 and 1063, there was no representation of commoners. The generally recognized first Spanish Parliament (with the presence of commoners), the Cortes, was held in the Kingdom of Leon in 1118. Prelates, nobles and commoners met separately in the three estates of the Cortes. In this meeting new laws were approved to protect commoners against the arbitrarities of nobles, prelates and the king. 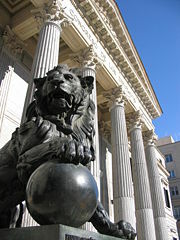 This important set of laws is known as the "Carta Magna Leonesa." Following this event, new Cortes will appear in the other different kingdoms: Catalonia in 1218, the Kingdom of Castile in 1250, Kingdom of Aragon in 1274, Kingdom of Valencia in 1283 and Kingdom of Navarre in 1300. The Cortes' assent was required to pass new taxes, and could also advise the king on other matters. The comunero rebels intended a stronger role for the Cortes, but were defeated by the forces of Habsburg Emperor Charles V in 1521. The Cortes maintained some power, however, though it became more of a consultative entity. However, by the time of King Philip II, Charles's son, the Castilian Cortes had come under functionally complete royal control, with its delegates dependent on the Crown for their income. The Cortes of the Crown of Aragon kingdoms remained with their power to control the king spending regarding to the finances of those kingdoms. But after the War of the Spanish Succession and the arrival of another royal house—the Bourbons—in 1714 with Philip V, their Cortes were suppressed (as were those of Aragon and Valencia in 1707, Catalonia and Balearic islands in 1714). The Parliament of the United Kingdom was originally formed in 1707 by the Acts of Union that replaced the former parliaments of England and Scotland–the Irish Parliament was subsumed into the Imperial Parliament in 1801. The British Parliament is often referred to as the Mother of Parliaments (in fact a misquotation of John Bright, who remarked in 1865 that "England is the Mother of Parliaments") because the British Parliament has been the model for most other parliamentary systems, and its Acts have created many other parliaments. Many nations with parliaments have to some degree emulated the British "three-tier" model. Most countries in Europe and the Commonwealth have similarly organized parliaments with a largely ceremonial head of state who formally opens and closes parliament, a large elected lower house and a smaller, upper house. In the United Kingdom, Parliament consists of the House of Commons, the House of Lords, and the Monarch. The House of Commons is composed of 646 members who are directly elected by British (or Irish) citizens to represent single-member constituencies. The leader of a Party that wins more than half the seats or less than half but can count on support of smaller parties to achieve enough support to pass law is invited by the Queen to form a government. Legally the Queen is the head of government and no business in Parliament can be taken without her authority. The House of Lords is a body of long-serving, unelected members: 92 of whom inherit their seats and 574 of whom have been appointed to lifetime seats. The House of Lords is the less powerful of the two houses as a result of the Parliament Acts of 1911 and 1949. These Acts removed the veto power of the Lords over a great deal of legislation. If a bill is certified by the Speaker of the House of Commons as a money bill (i.e. acts raising taxes and similar) then the Lords can only block it for a month. If an ordinary bill originates in the Commons the Lords can only block it for a maximum of one session of Parliament. The exceptions to this rule are things like bills to prolong the life of a Parliament beyond five years. If a bill originates in the Lords then the Lords can block it for as long as they like. In addition to functioning as the second chamber of Parliament, the House of Lords is also still the final court of appeal for much of the law of the United Kingdom–a combination of judicial and legislative function that recalls its origin in the Curia Regis. In October 2009, the newly created Supreme Court of the United Kingdom will fulfill this role. Since 1999, there is a Scottish Parliament in Edinburgh, which is a national, unicameral legislature for Scotland. With the rise of democracy around the globe, the next stage of parliamentary government appears to be transnational parliaments like the one in the European Union. The European Union was proposed in the wake of the Second World War, with the aim of ending the frequent and bloody wars between neighbors. The origin of the European Parliament (EP) goes back to the 1950s—and the union's founding treaties—and since 1979 its members have been directly elected by the people they represent. Elections are held every five years, and every EU citizen is entitled to vote, and to stand as a candidate, wherever they live in the EU. Parliament represents the interests of the Union's citizens in discussions with the other EU institutions. Members of the European Parliament (MEPs) do not sit in national blocks, but in seven Europe-wide political groups. The European Parliament has three places of work: Luxembourg is home to the administrative offices (the ‘General Secretariat’). Meetings of the whole Parliament, known as ‘plenary sessions’, take place in Strasbourg, France and sometimes in Brussels, Belgium. Committee meetings are also held in Brussels. Passing European laws - The most common procedure for adopting legislation is jointly with the Council, where the EP and Council are equal. In some fields such as agriculture and immigration, the Council alone legislates, but has to consult Parliament. In addition, Parliament’s assent is required for certain important decisions, such as allowing new countries to join the EU. Democratic Supervision - Parliament exercises democratic supervision over the other EU institutions, and in particular the European Commission. It has the power to approve or reject the nomination of commissioners, and it has the right to censure the commission as a whole. Parliament exercises control over the commission by examining council reports, conducting inquiries, introducing petitions from citizens, and provides input to every EU Council meeting. The power of the purse - Parliament shares with the Council authority over the EU budget and can therefore influence EU spending. At the end of the procedure, Parliament adopts or rejects the budget in its entirety, and monitors how approved budgets are spent. Preparing for the plenary session. This is done by the MEPs in the various parliamentary committees that specialize in particular areas of EU activity. The issues for debate are also discussed by the political groups. The official function of the European Parliament is to watch over the Commission's activities, but in fact this 732-member parliament has little power other than limited jurisdiction over part of the organization's budget. The British and French, in particular, have opposed giving the legislators any additional authority. ↑ Al-Hewar Center for Arab culture and dialogue. The Shura Principle in Islam Retrieved February 17, 2009. ↑ Haliczer, Stephen (1981). The Comuneros of Castile: The Forging of a Revolution, 1475-1521. Madison, Wisconsin: University of Wisconsin Press. ISBN 0299085007. ↑ The European Parliament. Europa. The European Parliament Retrieved Feb 17, 2009. ↑ History.com. European Union retrieved February 18, 2009. Haliczer, Stephen. The Comuneros of Castile: The Forging of a Revolution, 1475-1521. Madison, Wisconsin: University of Wisconsin Press. 1981. ISBN 0299085007. This page was last modified on 25 March 2015, at 15:28.